Dawlance – the no.1 home appliances brand of Pakistan, unveiled its impressive series of LVS plus and Energy Saverwashing machines, which aim to cut down on energy usage for a better and more prosperous Pakistan. The launch of these products is a testament to the initiative of Dawlance, where they believe in designing products that help reserve energy for a better Pakistan, thus ultimately reducing electricity bills. The LVS plus and Energy saver series automatic washing machines feature modern designs in three capacities for each series. The LVS plus Washing machines can run on voltages as low as 150 volts and save 38% electricity, while the extreme thirty minute dryer technique increases the performance efficiency by almost 17%, with the pro-fabric drum providing the perfect soft kneading effect for better stain removal. 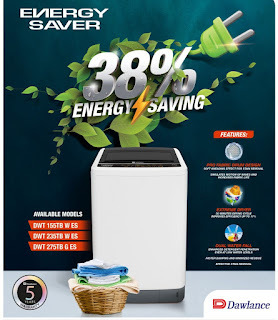 The Energy Saver series delivers well upon its name with best energy saving solutions and with a similar thirty minute dryer technique, in addition it also offers enhanced detergent penetration even at low water levels, which sets it apart. “The upsurge in frequent power breakdowns has drastically burdened Pakistan’s economy while the increasing tariff has been a cause of concern for every household,” he added while saying that the creative spark for out LVS Plus washing machines range stems from the desire to lower costs for consumers, and to serve the community by conserving energy. Moreover, for the first time in Dawlance, the brand is also offering a 5 year warranty service on motors of these automatic washing machines.